The blouse is a bright and bold colored large zig-zag print, the red vest is a soft knit pullover. 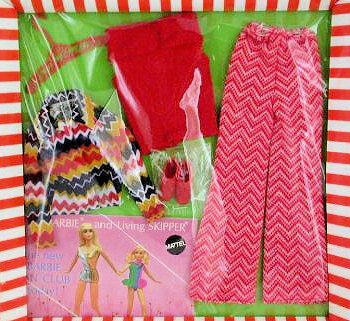 The bell bottom knit pants are a smaller red and white zig-zag print. This is one funky outfit!! I'm not sure how much demand there is for this - but it is hard to find. The red vest is by far the hardest piece to come by.